Presents social skills in the context of school. 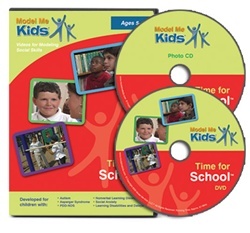 It features elementary school-aged children demonstrating appropriate social skills in the classroom, library, on the playground, and in the hallway. Each scene lasts between 30 seconds and 3 minutes, depending on the chapter. Includes Say Hello; Listen to the Teacher; Share; Say Sorry; Hands to Myself; Show Interest; Sit Quietly; Raise My Hand; Library; Playground; Take Turns; Self-Calming. At the end of each chapter is a storyboard summarizing the rules taught. The video is hosted by a young boy, who narrates each scene. The visual is combined with narration and graphics that help explain the particular rule. Each social skill is demonstrated in more than one situation and across environments. This is useful to children with Autism because it helps with generalization of the skill taught. Graphics and music are used to make the video appealing to children with Autism. Developed for children ages 5-12 yrs. with autism, Asperger Syndrome, PDD-NOS, nonverbal learning disorders, social anxiety, and learning disabilities & delays. Kit contains the DVD (61 min) and photo CD-ROM. IL K-6.